Ifriqiya or Ifriqiyah (Arabic: إفريقية‎ Ifrīqya) or el-Maghrib el-Adna (Lower West) was the area during medieval history comprising what is today Tunisia, Tripolitania (western Libya) and the Constantinois (eastern Algeria) — all part of what was previously included in the Africa Province of the Roman Empire. The southern boundary of Ifriqiya was far more unchallenged as bounded by the semi-arid areas and the salt marshes called el-Djerid. 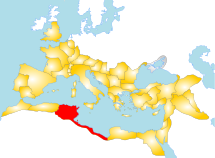 The northern and western boundaries fluctuated; at times as far north as Sicily otherwise just along the coastline, and the western boundary usually went as far as Béjaïa. The capital was briefly Carthage, then Qayrawan (Kairouan), then Mahdia, then Tunis. The Arabs generally settled on the lower ground while the native population settled in the mountains. The province of Ifriqiya was created in 703 ce when the Umayyads seized "Africa" from the Byzantine Empire. Although Islam existed throughout the province there were still considerable religious tension and conflict between the invading Arabs and the native Berbers. The beliefs and perceptions of people also shifted from area to area, this contrast was at its greatest between coastal cities and villages. 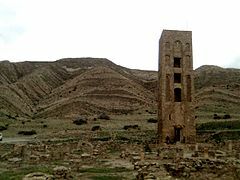 Muslim ownership of Ifriqiya changed hands numerous times in its history with the collapse of the Umayyads paving the way for the Aghlabids who acted as agents of the Abbasids in Baghdad. They were then overthrown by the Fatimids in 909 when they lost their capital of Raqqada and the Fatimids went on to control all of Ifriqiya in 969 when they took control of Egypt. The Fatimids slowly lost control over Ifriqiya as their regents, the Zirids, became more and more autonomous until the mid 11th century where they were fully separated. Religious divisions paved the way for the Almohads taking over Western Ifriqiya(Maghreb) in 1147 and all of Ifriqiya by 1160. This empire was to last till the early 13th century where it was then replaced by the Hafsids, who were an influential clan that boasted many of Ifriqiya's governors. The Hafsids in 1229 declared their independence from the Almohads and organized themselves under Abu Zakariya who built the Hafsid empire around its new capital, Tunis. Records of Arabic oral traditions imply that the Muslims first migrated to Africa feeling persecution in their Arab homeland. However, Muslim military incursions into Africa began around 7 years after the death of the final prophet Mohammad in 632. This campaign into Africa was led by the General Amr ibn al Aas and Muslim control of Africa rapidly spread after the initial seizure of Alexandria. Islam slowly took root in the East African coast due to cross cultural links established between Muslims traders and the natives of the African coast. The political situation in Islamic Africa was like any other, filled with a chaotic and constant power struggle between movements and dynasties. A key factor in the success of any hopeful party was securing wealth to fund a push for dominance. One form of great wealth was the lucrative gold-mining areas of Sub-Saharan Africa. The existence of these gold mines made expansion into Africa a very worthwhile endeavor. The Muslim Empires pushed for influence and control of both the Northern and Southern parts of Africa. By the end of the 11th century Islam had firmly established itself along the Mediterranean. The Muslims, like the Europeans, felt the brutal effects of the Black Death in the 14th Century when it arrived in Western Africa (Maghreb) through Europe. Maghreb and Ifriqiya at large were largely under the rule of the Ottoman Empire from the 16th to the 18th Century. Around the end of the 19th Century, Islam accounted for 1/3rd of the religious population of Africa. A hundred years after the Prophet's death the Arab world had expanded as far as the Indus River, thus stretching their empire across Asia, Africa and Europe. Arab merchants and wayfarers, along with clerics, began spreading Islam along the coast and in regions such as Sudan. Islam first took root with Sudanese merchants due to their increased interaction with Muslims. They were then followed by several rulers who in turn converted entire countries, such as Ghana, in the eleventh century and Mali in the thirteenth century. Due to the way in which Islam entered the African world, a large part of the rural population remained outside the Muslim realm. The spread of Islam was given new life in the eleventh century when an Islamic fundamentalist group of Berber nomads known as the Almoravids took control of the Western Islamic Empire. While Islam did spread throughout most of Africa it is important to note that it was a highly erratic process that occurred over a long period of time and was not constant or rapid. In some areas such as Ghana, the presence of the Muslims led to the founding of several mosques. It is believed that the Sudano Sahelian style of building was engineered by Malian king Mansa Musa, who brought back an architect from his pilgrimage to Mecca who's name was Al-Sahili. Musa's brother was instrumental in the construction of new mosques throughout the empire and established religious centres of learning to aid new and old converts in their empire. Timbuktu was one such religious centre that was responsible for a significant part of commercial and intellectual advancement in the Mali empire. In the 16th century a significant portion of Muslim scholars in Timbuktu hailed from Sudan. Arabic seeped into Africa and merged with Bantu to create Swahili. It is also believed that conversion was a useful way to avoid being captured and sold as slaves in the lucrative market between Lake Chad and the Mediterranean. For African leaders conversion was more of a political tool that was employed to gain support and legitimacy from the powerful Arabs who's endorsement would be useful in stamping out their enemies. However not all tribes readily accepted Islam and the Arabs as their superiors. The Mossi who resided in modern day Burkina Faso along with the Bamana empire in Mali expressed fierce resistance to Islam. Eventually, exposure to Islam led to the creation of an African strain of Islam with its own unique practices and rituals. Islamic prohibition on the depiction of people and animals was one that was accommodated and integrated into African culture. The charisma of early Muslim clerics in Africa drew swathes of people to Islam. These clerics who were known as marabouts, began producing amulets that contained verses from the Quran. These amulets gradually replaced the role of talismans in African cultures. The emphasis on avoiding representations of living beings reinforced reliance on geometric designs to create intricate patterns for textiles and other crafted goods. Masquerading was another art form that existed in an Islamic Africa and was performed in royal courts in countries such as Mali. However, the most noticeable Islamic impression was left on the architecture of Africa, mosques especially. Islamic civilization crashed into Africa and morphed into a hallmark of cultural diversity and this is reflected nowhere better than in the multitudes of mosques all across Africa. Constantine was a scholar who was born in Carthage and migrated to Sicily in the 11th century. Constantine had traveled through places such as Cairo, India and Ethiopia and as a result had knowledge of numerous languages that helped him interpret many different academic works. His greatest work came when he joined the Benedictine monastery at Monte Cassino. At the monastery, he translated over 30 books including a few works from Isaac the Jew, one of the most accomplished physicians in the Western Caliphate. He translated Muslim books on Greek medicine from Arabic to Latin, opening up Europe to a wave of medical knowledge they had little access to before. His book "The Total Art" is based off "The Royal Book" by Persian physician Ali ibn al Abbas. Ibn Khaldun was a historian born in Tunis and one of the most prolific academics in the Middle Ages. Ibn Khaldun's book Muqadimmah would influence waves of writers in Egypt, Turkey, and France through the 15th-19th century. Ibn Khaldun served in numerous political positions in al Andalus and Al Maghreb. He fell in and out of favor of the many different powers that rose and fell in Ifriqiya. In the latter parts of the 14th century Ibn Khaldun took refuge with a tribe in Algeria and began his 4 year long endeavor to write an introduction to history, Muqadimmah. Volume I laid the groundwork for sociology, while the two volumes that followed explored the world of politics, subsequent books explored many different themes such as urban life, economics and the study of knowledge. He spent his later years as a judge of the Maliki fiqh in Egypt where he took his work very seriously, evaluating each case on its merits and constantly trying to eradicate flaws that he discovered in the judicial system. His somewhat strict approach to Islamic laws made some Egyptians uneasy and so he eventually left his position and traveled through the eastern reaches of the Arab world. In 1400, he parleyed with Timur outside Damascus who was in awe of his wisdom. He managed to secure safe passage for many of the inhabitants of Damascus but could not save the city or its mosque from being sacked. After this, he headed to Cairo to spend the remainder of his years in relative peace and quiet. He died in 1406 and was buried outside Cairo. ^ (in French) Article « Ifriqiya » (Larousse.fr). ^ http://en.wikisource.org/wiki/Arabic_Thought_and_Its_Place_in_History : DE LACY O’LEARY, D.D. "ARABIC THOUGHT AND ITS PLACE IN HISTORY" London: KEGAN PAUL, TRENCH, TRUBNER & CO., LTD. / NEW YORK: E. P. DUTTON & CO. (1922), pp. 227-8. ^ "The Story of Africa| BBC World Service". www.bbc.co.uk. Retrieved 2018-12-12. ^ James, Fromherz, Allen (August 2017). The Near West : Medieval North Africa, Latin Europe and the Mediterranean in the Second Axial Age ([Paperback edition] ed.). Edinburgh. ISBN 978-1474426404. OCLC 973383412. ^ "Ibn Khaldūn | Muslim historian". Encyclopedia Britannica. Retrieved 2018-12-12. ^ See chronicles of Ibn Abd al-Hakam and al-Nuwayri for accounts of the conquest. ^ This follows the tradition of al-Nuwayri, who says Mu'waiya ibn Hudaij was the first emir of Ifriqiya (ruling from Baqra) in 665. Ibn Khaldoun, however, dates the appointment of Mu'waiya ibn Hudaij as early as 651/52, when Abdallah ibn Sa'ad was governor in Egypt. ^ This is primarily covered in the chronicle of al-Nuwayri. ^ Abulafia, "The Norman Kingdom of Africa"